Female singer-songwriter Avril Lavigne replaced comedian, Amy Schumer as the most dangerous celebrity to search for online. In Asia Pacific, Bollywood actor Shah Rukh Khan has taken over Indonesian singer, Anggun, as the region’s most dangerous celebrity. For the eleventh year in a row, McAfee researched famous individuals to reveal the riskiest celebrity to search for online. While the top ten “most dangerous” historically have included a mix of musicians, actors and TV hosts, this year’s research identified musicians as the top ten “most dangerous”. The research reveals which celebrities generate the riskiest search results that could potentially expose their fans to malicious websites. Avril Lavigne has sold more than 40 million albums worldwide, and is the second best-selling female artist in Canada of all time. Today, Lavigne adds “first female musician to take the No. 1 spot on the McAfee Most Dangerous Celebrities study” to her achievements. Lavigne was ranked number two in 2013 finishing behind Lily Collins on the list. Bruno Mars (No. 2) made his debut this year in second place followed closely behind by Carly Rae Jepsen (No. 3). Musicians Zayn Malik (No. 4), Celine Dion (No. 5), Calvin Harris (No. 6), Justin Bieber (No. 7), Diddy (No. 8), Katy Perry (No. 9) and Beyoncé (No. 10) round out the rest of the top 10 list. Cybercriminals continue to use the fascination of consumers with celebrity culture to drive unsuspecting users to potentially malicious websites that can be used to install malware, steal personal information and even passwords. 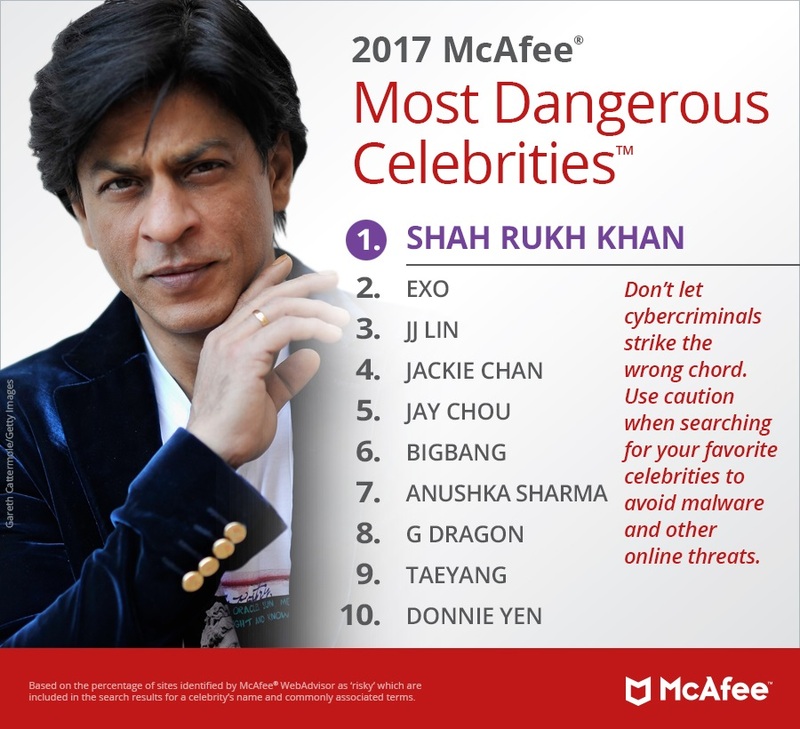 The study, conducted by McAfee and now in its 11th year, highlights the dangers of clicking on suspicious links when searching for celebrity-focused content. The global music market grew nearly 6% in 2016, so it’s clear that music continues to be a big part of the daily lives of consumers, so it’s no surprise that the top 10 celebrities are from the music industry. As artists go on tour, and release new albums and songs, the appetite for more content from these singer-songwriters continues to grow. 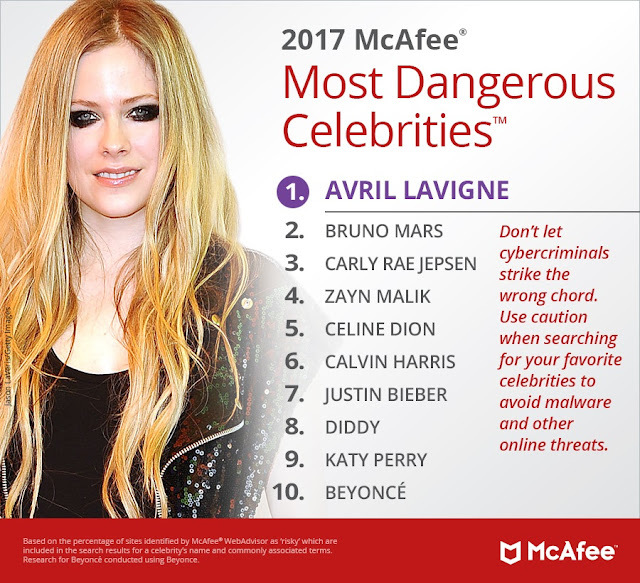 While the 2017 McAfee Most Dangerous Celebrities global study was dominated by musicians several actors and actresses found their way onto the list including Anna Kendrick (No. 13), Jennifer Lopez (No. 20), Hailee Steinfeld (No. 23), Will Smith (No. 34), Jackie Chan (No. 38), Vanessa Hudgens (No. 44), Teyana Taylor (No. 45), and Zendaya (No. 50). In contrast to the global study that saw musicians dominating the top 10, the Asia Pacific study found four actors making it into the top ten. These actors include, Shah Rukh Khan (No. 1), Jackie Chan (No. 4), Anushka Sharma (No. 7) and Donnie Yen (No. 10). Be careful what you click. Are you looking for a sneak-peak at Avril Lavigne’s rumored 2017 album? It’s better to wait for the official release than to visit a third-party website that could contain malware. Searching for free MP3s? Watch out! Searching for “free MP3” returned the highest number of risky websites, so it’s important for consumers to be vigilant and ensure they are searching safely. Browse with security protection like McAfee WebAdvisor. This McAfee tool can help keep you safe by identifying malicious websites and warning the user before they click. Download this free tool here: https://mcafee.com/mcafeewebadvisor. Use cross-device protection. As our daily activities become more ingrained in our digital lives it’s important to keep everything protected. A comprehensive security solution, like McAfee Total Protection, can help ensure that your devices are protected against malware, phishing attacks and device-specific protection in the event of loss or theft.